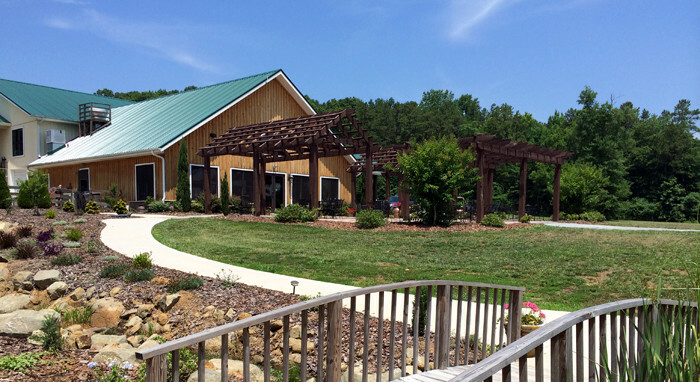 Located in the Piedmont region of North Carolina and recently awarded Grape Growers Excellence Award, Morgan Ridge Vineyards has been creating quality wines since its inaugural vintage in 2007. Owners Tommy and Amie Baudoin operate the vineyard and on premise winery while striving for balance and producing the best fruit possible to be used in the creation of their award winning wines. Planted in 2004, the vineyard boasts seven prime acres encompassing seven different varietals used in the production of over 1500 cases of estate wine annually. The winery features a tasting room for visiting connoisseurs and recently started offering crafted beer. The facility includes on open air pavilion and dressing rooms that is available for weddings, private parties, corporate gatherings, and other events. A full catering operation is located onsite and is ready to serve your needs. Original art by award winning artist Robert Crum (our wine label artist) is available for viewing inside the Morgan Ridge wine tasting room and on the exterior grounds. There is so much to see and do at Morgan Ridge Vineyards – you will enjoy your visit!